I love color!!! Today, I’m doing an experiment with warm and cold underpaintings. 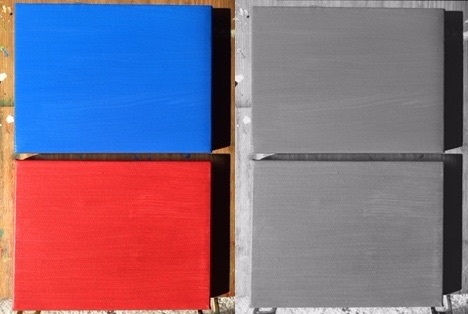 The first is Cobalt Blue with gesso, and the second is Cadmium Red with a little Burnt Sienna. The grayscale photo shows they are of the same tone. I will paint the same lilly pads with flower on each. Hopefully I can post at least one of them later today. This entry was posted in Art, daily painting, Painting and tagged Acrylic, art, blue, daily painting, experiment, impressionism, lily pads, Painting, red. Bookmark the permalink.